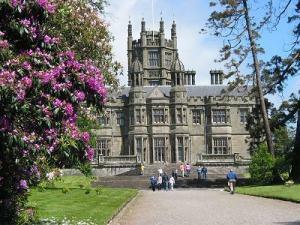 Margam Country Park & Castle Country ParkMargam Country Park, where in addition to the splendid landscapes, architecture, rich heritage and cultural past, you can enjoy a full programme of entertainment for the whole family throughout the year. The castle is a 19th Century Tudor Gothic Mansion was designed by the architect Thomas Hopper for Christopher Rice Mansel Talbot. The house was built in 1830 – 40 at a cost of £50,000 using sandstone from nearby Pyle quarry. Listed Grade I as a mansion of exceptional quality, the Castle has some spectacular features such as the vast stairhall and octagonal tower. The outbuildings around the Castle Courtyard house the Visitor Centre and park administration and during the summer months, the Great Hallway is on display to the public. The Visitor Centre includes Charlottes Pantry Cafe, the Gift Shop where information about events and activities is available and toilet and baby changing facilities. It is also the starting point for all walks around the Parkland. Margam surprises around every corner, from the magnificent 18th Century Orangery, an impressive and picturesque Tudor-Gothic style Victorian Mansion House, a 12th Century Chapter House, ornamental gardens and the best deer herd in Wales. The Orangery is the dramatic and magnificent centrepiece to the Gardens. Designed in 1787 by Anthony Keck, it is of regular classical composition, magnificently ornamental in appearance and superbly functional in design. Aligned east-west and at 327 feet in length, it is the longest Orangery in Britain. The narrow gauge railway, children's adventure playground, farm trail, Fairytale Land and the splendid walks are some of the features which contribute to the experience of Margam Country Park together with a mixed coarse fishery at Furzemill Pond and a programme of seasonal events. Margam Country Park, where in addition to the splendid landscapes, architecture, rich heritage and cultural past, you can enjoy a full programme of entertainment for the whole family throughout the year. Margam Country Park is open all year round so you will always find something to make the visit worthwhile whatever the season. Entry to the park is free although there are charges for parking. Prior to your visit, please check that the date of your visit does not coincide with a special event being held at the Park, for which separate charges apply. By Bus: there are bus stops at the main road entrance, a five minute walk to the Margam Park reception area. From Swansea, Bridgend, Pyle and Port Talbot bus and train station take the First Cymru X1.